... but I did get into SkypeOut yesterday. I've been using an Andorra Mobiland SIM to ring back to the UK, which isn't cheap - but it is cheaper than being stiffed by VodaBone for 75p + 99p per minute(!) - SATTELITE PHONES ARE CHEAPER THAN THAT! Skypeout charge me 1.7 CENTS a minute - i.e. just over a penny. Good job I brought this laptop out, I knew it would be useful but I didn't realise just how useful. I expected to do some skyping with Nic at home but I didn't think I'd prefer to call the UK using my laptop, period! 10 euros of credit are going to last me all month! Even if you call a mobile from skype it's still only 20.7 cents a minute. Not too shabby. My folks were certainly impressed! Oh yeah, missed the bus. The Aspen Staff Lunch (as arranged by the inimitable James) is today - and I slept in, despite getting an earlyish night! The pub crawl night last night was busy for sure, we got a little sidetracked when Steve's highhat pedal (this is one he's using to replace the one he has already ditched!) came apart just before we started the Arctic Monkeys... but the final set turned out OK! I suspect we're all waiting for another insane audience like last week's. Maybe tonight will come up trumps! I thought about going up the mountain today but decided on reflection I'd rather come down to my favourite watering hole and get a lemonade or two in me. The sun is beaming down on us again, the snow we had in town has melted but the stuff on the mountain still looks pretty good on the runs down to the gondola. I'll go out on thursday and try to get a full day in - wednesday's apres gig finishes early so I can try to get my head down to get up for the first lift if possible. I think the season pass is probably an expenditure I'm not going to need - if I got up the mountain 3 times a week I think I'd probably collapse on stage!! Actually, I'd probably get fit enough that I'd do better on stage so maybe it's time to be honest and say that I'd rather be boarding up there with Nic!!! I do get into it on my own eventually (just me and the iPod) but it's the getting up and getting up there that's tricky. I am really king dweeb. I always used to put the webcams for the resorts I was heading for on my desktop at work.... old habits die hard! Sorry about the weekend off from posting (I know there are many millions of you out there keen to read a blog which contains no political analysis, up-to-date opinions of crappy news events, endless negativity about the the human condition, etc etc etc!) it's been sort of hectic, but lots of fun. I've secured a great deal to keep getting the internet from the brussels, I can really recommend this place - they're really friendly, the food is great and the internet is high-speed. That's my dweeb recommendation anyway :) I like the light while typing as well. The Aspen is a totally different kettle with wicked pool tables, table football (good ones too) and big screen sky and snowboarding DVDs - and the attic serves the best texmex I've had in a while (apart from my own chillis, of course, which have a reputation all their own). In other personal news, I think some of the chubby may be shed from my waist before the end of the season - belts are being tightened to prevent any Jim Morrison style antics onstage! I would hope that all this effort and hard work would pay off! Right, more emailing to do... hey you Panasonic types, did you get my mail???? Where are you all? OK, I know you're at work, and I definitely sent the emails there... Tell me I'm not that depressing, am I? Yipe! Big night last night. Oh yes. 1. The audience were mad - learned "shots!" in only 2 takes! 4. Irish people on the top floor jumped and shouted so hard I thought the balcony would come down! 5. Radio pack annoyed Jay again - but he accidentally pulled it out of the guitar we reckon! 6. I played the Warwick and it sounded SPEC-tacular compared to the hohner - I hadn't realised - plus lower gauge strings = VERY fast playing. Funky, too. Felt very familiar and highly malleable! 8. Everybody else rolled in about 4:30am I think and I woke at 5 with Steve praying to the pocelain god (poor lamb!) - these great gigs tend to leave the kids (as I comedically call them) "up for it" as I believe they say (where's me zimmer) - I think Jamie's missed the lesson he was due to give this PM! Right, apart from that, I've been busy posting things to Myspace, including a couple of new videos - so get on over there (the link's on the right somewhere!) and have a look! Must get back up the hill and get ready for apres ski! The van is now stationed at the bottom of the hill in a car park in case of more snow, it doesn't cope well with the hill... my gaffa tape fix of the coolant pipe to the expansion tank seems to be holding, more or less - certainly, the tank didn't empty! Hopefully there's good antifreeze to protect against the lo lo temps we've got now (mainly thanks to the snow I think). Gotta scoot and pay my brussels bill (mmmmm tagliatelle bol today, more than I could eat for 8 euros!) - I just camp in here during the day really! It's been a long time since I lived in a house with other people, and boy can I tell :) Admittedly this is a band I'm living with here, and maybe I'm being over cautious (what, me????) but I can't get merry every night and still put in a gig the next day... besides, I want to get up on the mountain! Now that the new snow is here, I really want to get those bindings... that burton board looks like a piece of installation art! That's just wrong, as Steve would say....! wicked shot, eh? I need to pass my bike licence when I get back so I can tour places like that. B&B hopping in the northern summer sounds like a nice couple of weeks. Wonder if Nic and I could get up there on the train with the bike? This weeks rock n roll cliche: repairing a coolant tube in the van using gaffa tape (your truly) so we could make it to the apres ski gig on saturday! 5 days in a row my friends and we have torn up every night... now it is a time for Zen like reflection, for sitting cross legged on a piste contemplating the higher things. Like curries. And then it's back to the posing on friday! I meant to go up the mountain today (looking good up there, new snoooooo) but managed to answer 3 texts, turn on the laptop for TV then fall asleep again until 2pm. D'oh! Holy cow, it's snowing. Big fat flakes of it. The pavement outside has gone white in about 10 minutes. Scary! It's been bright sunshine (I'm talking t shirt weather) since I got here - the whole of europe has deferred winter, it seems, even moscow's red square didn't get any snow this january! I think the big ol storm which wrecked big bits of aforementioned Europe (Germany in particular got hammered) finally blew that high pressure off the map and now the cold front is reaching down from russia over france and into spain (touching the pyrenees!). It's good news though, the lower pistes here had gone very very brown, and I gather the reservoir for the snow cannons was used up too. Phew! Perhaps the season will last a little longer. Well, a lot has happened so far. Plenty of gigs, some of them quiet (the après ski gigs at the Alba hotel in El Tarter are very laid back – we actually do a couple of slow blues numbers and they go down really well amongst the usual high-octane insanity) and a lot of them VERY loud. We’ve done 3 full gigs back-to-back in the last 3 days, and tonight’s is a scheduled full gig (as I write this it’s Tuesday), so that’ll pay the rent for this month. Very reassuring! My gear is holding up well. The 2x10 trace cab I sent down with Jamie provides some much-needed mid and top to the Trace V4 combo, which is a monster. The bass POD is doing great, and I’ve been tinkering with sounds this evening trying to get the levels right on the patches I use for soloing. I had set them up before and didn’t realise they were absolutely massively louder! I’ve been trying to use the SoundDiver software that came with the POD too – I can get MIDI out to it from the Tascam 122L I got – but the software doesn’t seem to be able to find the pod. I’ll have to check the web for updates when I hook this laptop up to the Aspen’s ADSL to send this stuff. Ironically, I’ll probably use the cable I hook up the foot controller for the POD with to plug into the Aspen office Ethernet – it’s a standard cat 5 cable! I like that, it’s good design – no need to reinvent, and cheap cable replacement when required. The Aspen is a great place to play. The stage now has the backdrop (which Nic made ages ago – we projected the logo onto a sheet and Nic did the rest! ), the speakers out front as a runway for Jamie (and myself!!!) to pull all the rock and roll poses necessary to entertain the crowd, and thanks to Nero 6 and Nic (thanks honey!) we now have a slideshow DVD of pictures, logos and URLs projected onto a massive screen above us as well! It all looks really pro, and when I finally get hold of those stage lights it’s going to be the most professional looking stage in Soldeu – actually, there’s probably only places in Andorra La Vella which would look better. As regards the audience side of the stage, that’s great too. Large area out front of the stage between us and the bar, stairs to the upper level where they have 3 full size pool tables and balcony seats with tables to watch the band from…. It’s a great venue. You get people cheering and singing along on 2 floors in front of you – and if the DVD player is playing our DVD slideshow and all the screens are showing it, you could rename the place the Janeiro Bar….! So… I can hear you all asking how a Janeiro show runs. It’s pretty much on-the-spur as to which songs we play (I’m now doing vocals on Basket Case and Dani California by the way!) but there are some set pieces during some of the songs. “Mustang Sally” features Steve the drummer belting out the vocals and Jamie and I sharing the mike out front and “ooo-ooo-ooo” ing all over the place, beatles style. The audience gets a great chance to sing during that one. Last night Jamie and I were goading the audience with the promise of a free shot for the best voice in the audience (which basically means the one who looks like he’s about to pop something when he sings) and had great fun pointing and nodding during the audience participation bits. “Johnny B Goode” has a spectacular mid section during Jamie’s big solo where he plays his guitar slide-style with any object James the bar manager can rustle up – so far, I’ve seen jamie play with a spade, a fire extinguisher, a beer barrel, and beer sign, several bottles of bud, one of his other guitars (that WAS impressive), someone’s pint, a packet of fags, a mop head(??? )… I’ve taken to doing a little Bud-slide myself during that bit, sounds weird but great fun. We also have a little country n western benny hill action (I kid you not) with the theme from Benny Hill's little bawdy chase sequences as what essentially amounts to a bar order. We call it "shots!" and it gets a round of Sambucas from the bar, which we then toast the audience with. By the end of a night most of the audience are joining in and shouting "shots!". We seem to be able to get an audience to really get into the spirit (sic) of the show and join in! Home life in the flat here at the top of the hill is pretty much settling down – we’re usually all awake by 12ish (I tend to get back here fairly soon after the end of the gig) although the guys have been getting in pretty late after post-gig partying and as a result I think Steve holds the current record with 5pm(!) – I can see I’ll have a spot of gig-lag when I get back to the UK, I’ll have to retrain myself a bit! We’ve got TVs, DVDs, PS2s etc in the house, and Steve bought a little digibox for about 30 euros which gets a fair few local channels and BBC world. It’s got the advantage over the Freecom DVB stick I got in that it detects and can use alterative audio channels within a TV channel – Nic, you’ll be happy the hear that K3/300 can show you Dallas, Land of the Giants, Beverley Hills 90210 and Star Trek with the original English soundtrack! The other channels are all French, Spanish and Catalan. 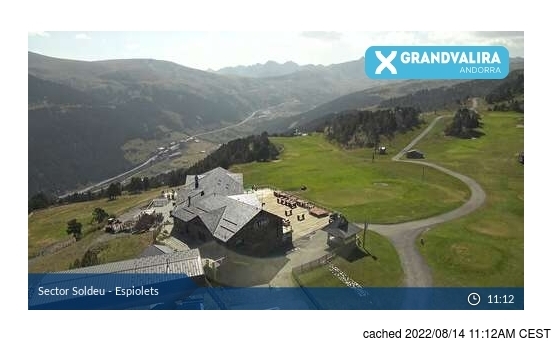 Speaking of TV channels, there is an Andorra TV channel (good music TV during the day) – and they’re going to be at the Aspen tonight filming us! I’ve got my LED VU level T-shirt my folks got me for Xmas (posted out to here no problem!) and tonight I’ll be flashing the audience plenty. Stop sniggering, Pearson…. Only worry at the moment is the lack of snow – the cannons were out of commission last couple of days as it got too warm, but it went very chilly today and the cloud has moved in – so here’s hoping for fresh snow and plenty of it! More later – long long postings can be tiring on the eye…. And the page! P.S. Chris Last, I'll post some pics ASAP - battery out on laptop! Nic took this pic - I love it! The red LED on the hohner looks fantastic. I'm standing on the speaker cabinets. First night I did that I overestimated what I could do and very nearly overbalanced onto the stage in a nasty manner... could have been a right "canada trip" that! A posting from the Pyrenees!!! Holy cow, we made it! 14 hours (with 1 hour for misc stops including several cans of red-bull style drink for Andy) and aboot 500 miles of rain for the second half, but we made in in a oner. I can recommend using the channel tunnel to get across BTW, 35 minutes and you end up popping up near the calais ferry terminals. Very useful for a quick trip to Eastenders (which was sadly shut when we sped by!). Soldeu is really pretty, the ski area is pretty big across the GranValaria area BUT... at the moment we're in a snow crisis and no mistake! The alps got a big dump the other day but it didn't get down here..... still, Nic and I went up the slops today and had a lot of fun on the pistes which the guys are doing a great job of keeping in a remarkably good condition. Good on them. The gigs?... they're great fun. We've got a really good looking stage at the Aspen where our main gig is (as Janeiro, no less!) - the backdrop is in service and looks the part. I'll post a picture of the stage as soon as Nic (our caterer, transport specialist to Pas de la Casa and photographer!) takes one. Funniest moment at the mo is Jamie being called "steve" in 50,000 copies of the village magazine (the season's one!) - J is taking it rather well :) We helped out Elvis with his stage setup the other week... I repaired his mike cable. How surreal... he does a great Brucie impression as well. Right, gotta scoot. I'll post again soon! Well, you still have to wait it seems :) Glad we decided to do it this way, it's really windy out there and I get the feeling we'd both be a little green on the ferry. Speaking of ferries, satnav reckons the chunnel is one. "unspecified ferry", it thinks. Hmm. Nice sunny day, the gulls are wheeling around and the car is full. Couldn't bring the mixing desk, sadly, it wouldn't fit! Also, I think it would have been to big to be useful in soldeu, apprently the aspen stage is smallish and the existing mackie desk is rack mounted with the poweramps in a cool wheelie coffee table thingy! Anyone know if the horse carved into the hill beside us while waiting for boarding is the EDF energy logo? BTW, hope they sell strings out there, I've got some but not a massive amount! Also need a small Midi controller, maybe a couple of octaves.